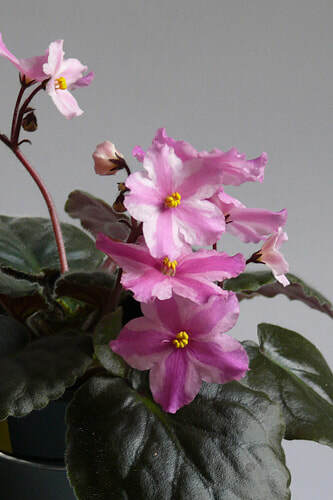 General Grooming - African Violet Society of WA Inc.
Grooming of African violets can be a continuous process. Once a Week – Check for suckers. These are mini plants that grow from the base of the cultivar and are usually found under a larger leaf. Remove excess and spent bloom stalks and spent blossoms.Remove undesirable leaves and help new centre leaves to lie flat.Using a natural sponge or tissue, pat up any spilled fertilizer solution from foliage.Large droplets of solution may spot sensitive foliage. Once a Month – Wipe the foliage gently with a damp cloth. Every two or three months – Gently wash the foliage under tap (preferably warm) water which has a shower type output. Removing Suckers – Remove suckers before they become large enough to distort the symmetry of the foliage. Removing Leaves – During the weekly watering period is not the time to study the plant’s symmetry or to take extensive corrective measures. However, leaves that are obviously limp, immature, etc, should be removed. 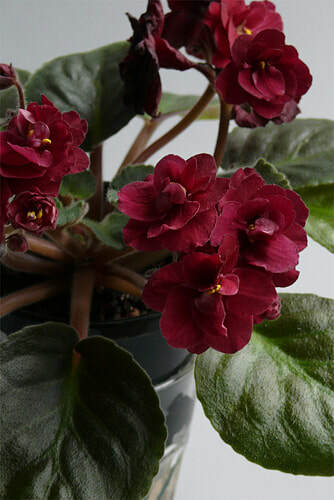 Take care that you are not over watering your African violets and a wick watering system can be best. Removing Spent Blossoms and Bloom Stalks – Removing faded blossoms and peduncles is part of the weekly grooming. Checking for, and possibly removing, excess bloom stalks should also be done weekly. However, removing peduncle and pedicel stubs is part of final grooming before a show. 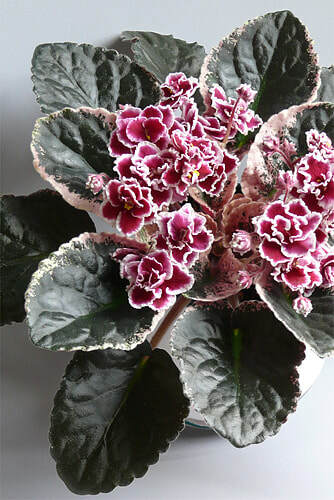 Brushing Foliage – Because of the hairy leaves of African violets and humid atmosphere, it is impossible to brush away dust without damaging the texture of the leaves. The only time foliage should be brushed is to flick away soil particles, etc, with a very soft bristled brush. A paint brush or similar maybe an alternative choice. 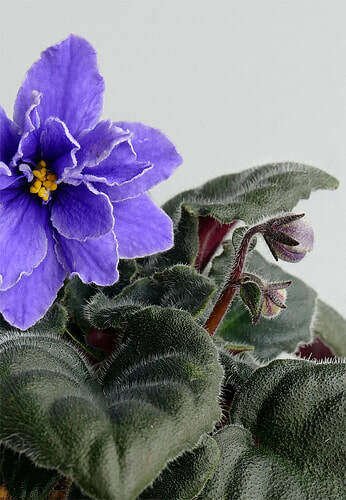 Damp-wiping Foliage – Dust is not easily seen on African violet foliage because of the matte finish created by the minute hairs of the leaves. If you need reminding of how dust accumulates, check a tabletop that hasn’t been dusted for a few days! It is necessary to damp-wipe foliage only about once a month. Even though some dust will have accumulated, adequate respiration is taking place from the undersides of the leaves. Washing Foliage – Wash foliage when the temperature is at least 21 degrees Celsius and early enough in the day so that foliage dries before the lights turn off. Run tepid water over the foliage with the pot tilted so that the water does not flow into the pot, supporting each leaf in turn whilst using your thumb to wash away any imbedded grime. It is not necessary or advisable to wash the centre leaves. However, if some water does enter the central area, then tilt the plant and pat up excess water with a soft natural sponge or tissue, and place the plant back under the fluorescent lights – fluorescent light will not burn wet foliage. However, if large droplets of water are left on the foliage, the mineral content of the water may leave permanent spots. Sometimes water spots can be removed by damp-wiping the foliage with a weak vinegar solution – a couple of drops to a cup of water. Protect plants from drafts until foliage is dry.